Giovanna’s love of photography started 40 years ago with her first ever job managing a black and white photography studio in Wellington, New Zealand. She then moved into wedding photography /styling for 8 years in Australia and that led her to becoming a school photographer in Sydney and New Zealand for many years. In 1997 Giovanna started her own buying business which required her to travel extensively in India, Bali, Nepal and Burma. This gave her the opportunity to travel to exotic countries and pursue her love of photography by capturing people in their natural environment and telling their stories without words. Giovanna has had 5 photographic exhibitions in Australia and Bali. 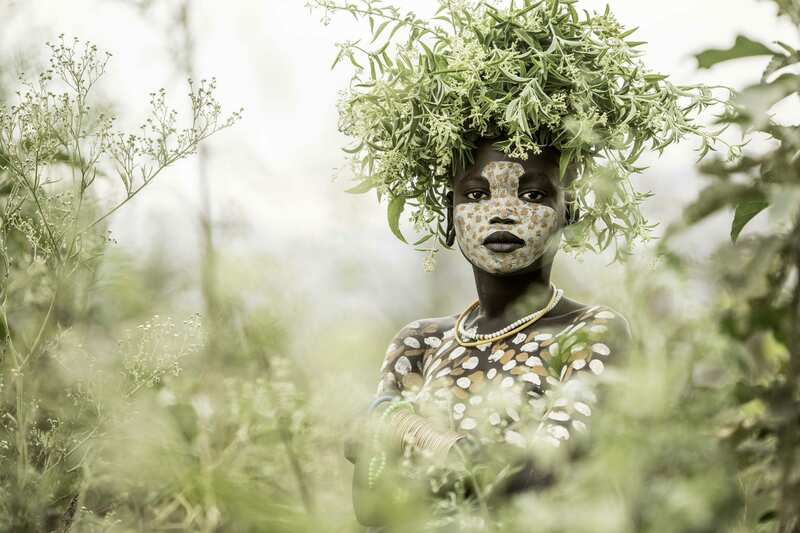 In 2018 was chosen to exhibit at the African Photography Festival in New York. For the past 15 years, she has produced greeting cards from her images through Australian Company Spirit Publishing. Her last travels were to the tribes of Omo in Ethopia. Peeping through the bushes I noticed this young girl from the Suri Tribe, using the greenery as a frame and capturing her beautiful inquiring expression.